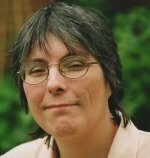 Master chain stitch embroidery today! Chain stitch embroidery has been with us for a very long time! 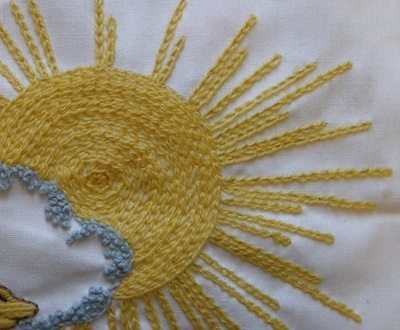 It is one of the basic embroidery stitches and has many variations. Once you have mastered this simple stitch you might like to try out my free fishy lesson, which includes 6 different types of chain stitch. It can be used for both outlines and to fill in areas of an embroidery design. The sun in this photo shows both. Secure your thread to the back of your work with an away waste knot, and bring the needle through to the right side on the line you want to follow. Go back down as close as possible to your starting point and bring the needle back up a short distance along the line of the pattern. 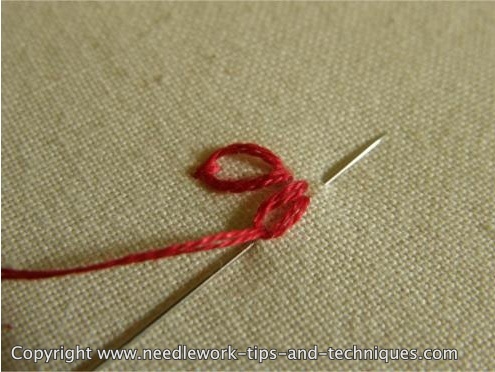 Before you pull the needle right through the fabric, make sure that the working thread is underneath the needle. Then pull the needle through forming a loop or chain on the surface. Re-insert the needle, next to where it comes through the fabric, inside the loop of the first chain and again, bring it up further along the line. 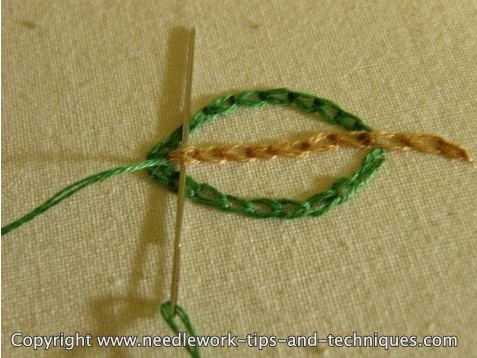 Tuck the thread under the needle and pull it through to make the second chain stitch. Continue in this manner until the line of chain stitch embroidery is complete. After you have completed the chain you can whip another thread through each stitch, either with the same colored thread or a contrasting one. This gives a raised line with a little more definition. Let's use it for the vein of our leaf we worked above. 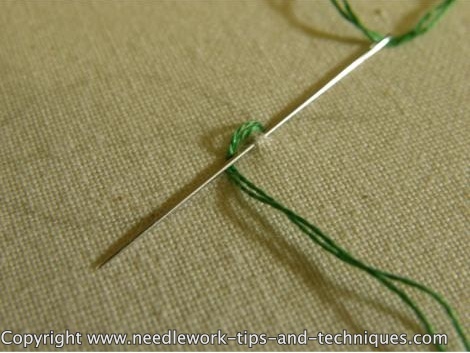 Thread a blunt tapestry needle and secure your thread to the back of any existing stitches or use a waste knot. Bring the needle to the front of the work at the end of the row of chain stitches. 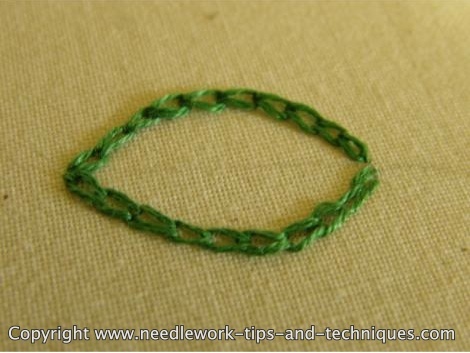 Gently slide the needle underneath the two loops of the first chain. Continue along the row always sliding the needle underneath from the same side, to form a rope effect. This whipping thread does not go through the fabric at all, except at the beginning and end of the row. 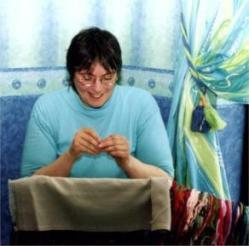 If we were to use a sharp needle it could accidentally pierce the fabric, which is why we changed to a tapestry needle. This is the effect we end up with when a contrast thread is used. 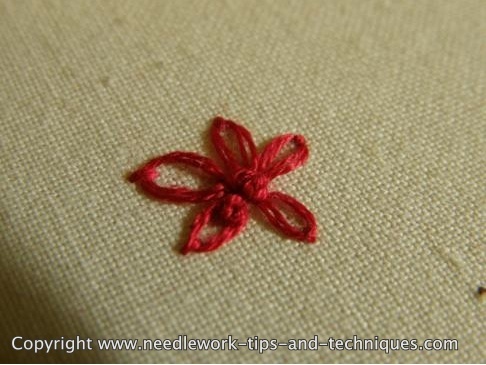 Lazy daisy or detached chain stitch starts in the same manner. If your fabric is marked to show where these stitches will go then bring the needle out just before the line. 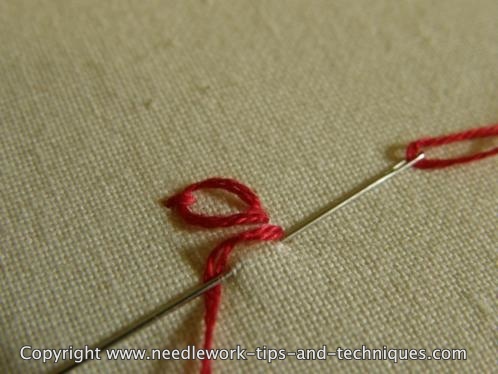 Make sure the thread is under the needle before you pull it all the way through, as before. This time instead of taking the needle down inside the loop, push it through the fabric just outside the chain to tie it down. 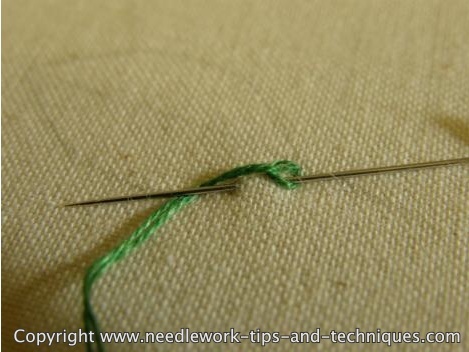 Then bring the needle back up in position for the next stitch. 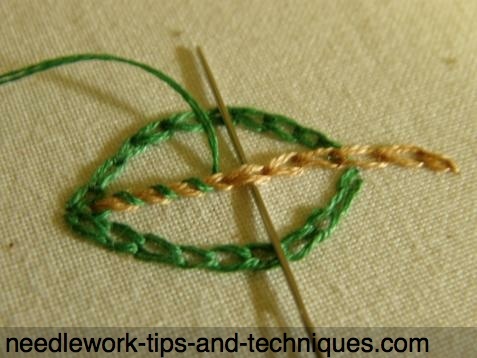 Don't pull the thread too tightly or you will end up with a loop that looks like a straight line rather than a oval. This stitch is often used to create flowers. When all the detached chain stitches are in place you can fill the centre of the flower with French knots. Lazy daisies can also be worked in ribbon embroidery. The sample worked here used 2mm wide Offray embroidery ribbon and measures about 1 inch across at its widest point. 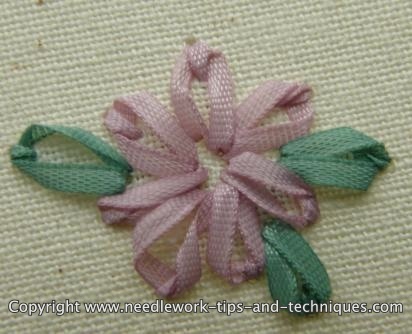 Check out the embroidery stitches for flowers page for more ideas for using this versatile stitch. Check the stitch index for more basic embroidery stitch instructions. 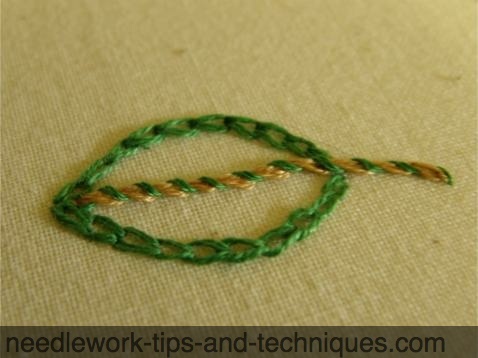 I hope these photos and instructions for chain stitch embroidery have helped you.